In light of the Town of Darien considering a ban on plastic carry out bags, The Maritime Aquarium at Norwalk celebrates such municipal efforts and encourages other communities to take up the cause. A public hearing is planned for Wednesday, Feb. 6 to gain Darien residents’ input on a proposal to ban plastic bags. 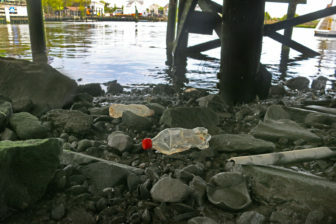 If such an ordinance is drafted and eventually approved, Darien would join Westport, Greenwich and Norwalk in Connecticut, and Larchmont and Rye Brook in Westchester County, New York, in prohibiting retail stores from offering plastic bags for purchases. The Maritime Aquarium eliminated nearly all single-use plastics from its operations last year. Gone from the cafeteria and theater concessions stand are drinking straws. Guests have the option of boxed water or beverages in glass and aluminum containers, instead of in plastic bottles. Plastic silverware, coffee lids and food containers have been replaced by biodegradable substitutes. In the Aquarium’s gift shop, plush animals no longer are stuffed with plastic beads, toys no longer have cellophane wrapping, and purchases no longer go into plastic bags. Learn about the Aquarium’s efforts here. Women have made many economic and social advancements, but another gender gap is closing: drinking rates among men and women. Researchers believe that rates of female alcohol consumption — and alcoholism — have escalated due to shifting cultural messages about women’s drinking, along with the growing number of women turning to alcohol to alleviate stress.